Happy Thursday!! Welcome to day 4 of the WPlus9 April release! I have another card to share with you using "Filigreed Frames" set. I shared a little bit of info on the set yesterday, and today I wanted to let you know that Dawn actually has the full reveal up on the WPlus9 Design Blog! So, you can see the whole release for yourself...and get a chance to win it! Just be sure to answer Dawn's question that she posed in the post. WPlus9 has also partnered with The Play Date Cafe, where Dawn is the guest designer, and also offering up a prize to one lucky participant!! 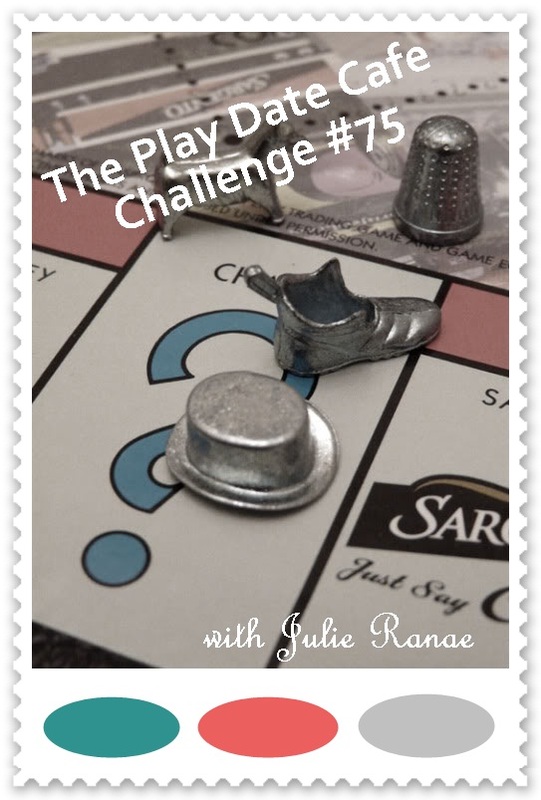 So, be sure to head on over and participate in Challenge #75 at PDCC by April 5th at 11:59pm for a chance to win. Here is my disclaimer though...make sure you use all the correct colors. Tee hee! You see- we were given the colors beforehand, so we could all participate as well. And I promise I looked at the colors, but obviously not well enough. And then I did remember the Monopoly game in the background, and Monopoly is red. So- I used all the correct colors...except the red, which should have been pink. But, what can you do...I am owning up to my whoops, and am still going to share my card with you...one wrong color and all. :) I also used the Viva la Verve! March 2011 Sketch #4 for my card. Instructions: Fold red cardstock in half to make card base, and round the upper right corner. Cut blue paper slightly smaller than the card, round the upper right corner and adhere to the front. Cut two more blocks of patterned paper, round the upper right corners, and layer to the card front. 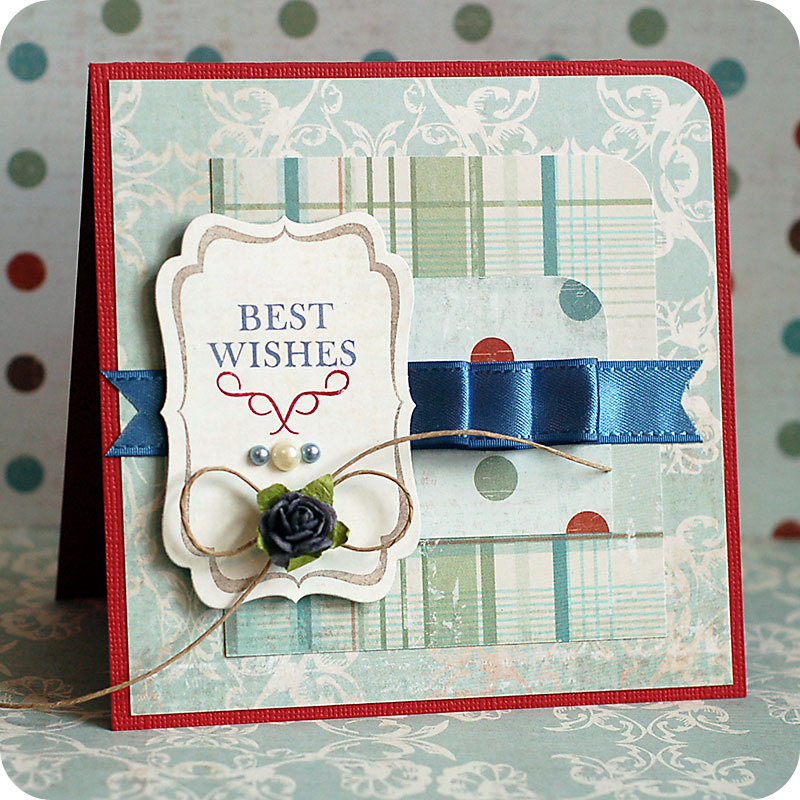 Add the ribbon treatment to the middle of the card, adding three pleats to the right hand side of the ribbon. Diecut and stamp the frame, then adhere to the left side of the ribbon with foam adhesive. Tie a bow from twine, adhere it to the bottom of the frame, and accent the middle with a gray flower. Add three pearls to the frame to finish. You know what...even though I got one of the colors completely wrong in the challenge- I love this card. I love how it turned out, and if I hadn't gotten the color wrong, I don't think I would have used these older papers. And I am so glad that I used them...they are beautiful. But, this little mistake will teach me that I need to print out my challenge information...not just try and pull it from memory. Ha!! Well, I am assuming that the rest of the WPlus9 design team members that are participating in the challenge actually got the colors correct! So, make sure to check out their blogs and see their beautiful creations with "Filigreed Sentiments". THIS is mind-blowing! 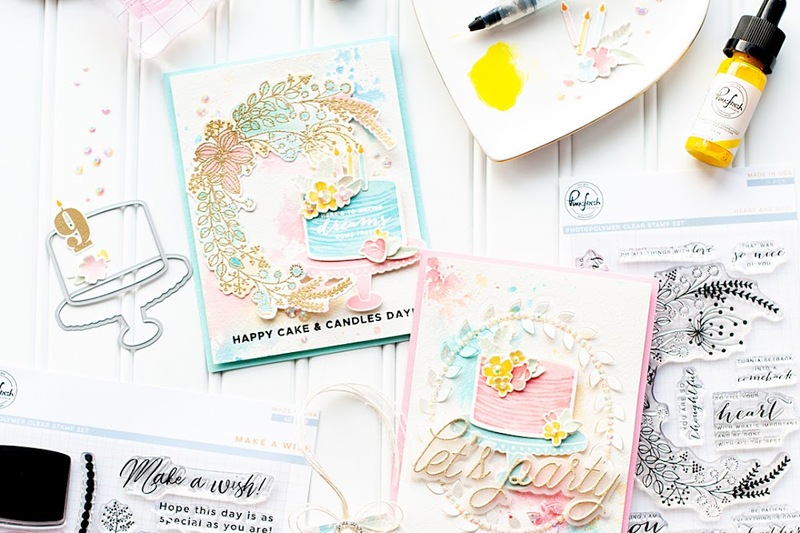 POSITIVELY gleaming and amazing use of color: I'm smitten! YOU have me at the vertical frame/acclimation! SOOOO much fun seeing the AMAZING things you do with Dawn's images! Yeee Haw! You are a DELIGHT! You are too funny girl! This was a tough color combo...and trust me I had to keep going back to it cause I was so lost! LOL But you sure did ROCK this card! I LOVE that you switched up the frame and made it vertical! I will def have to try that out...and love all the beautiful details! This is positively divine! 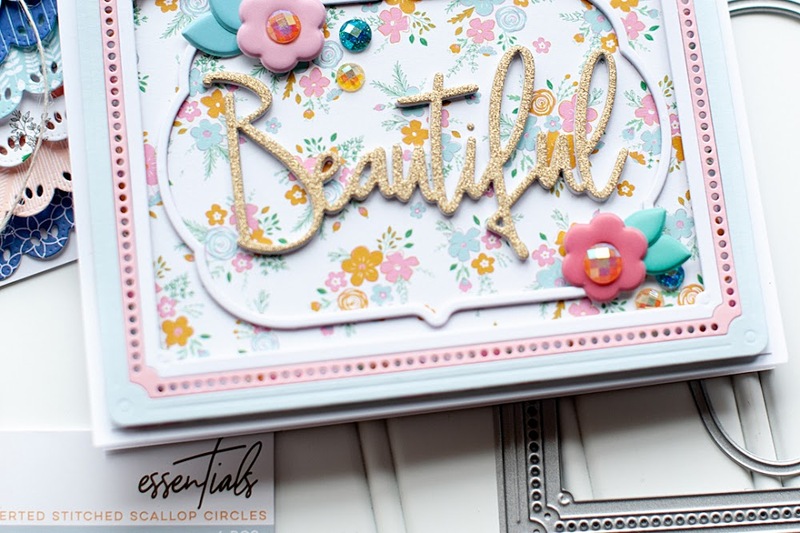 Love, love, LOVE that you found some patterned papers to match; and your use of the die and frame, with all those sweet little embellishments, as well as the way you highlighted it with that scrumptious ribbon is fantastic! 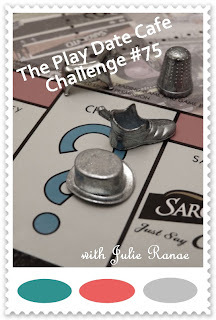 Thanks ever so much for playing along with us this week at The Play Date Cafe! 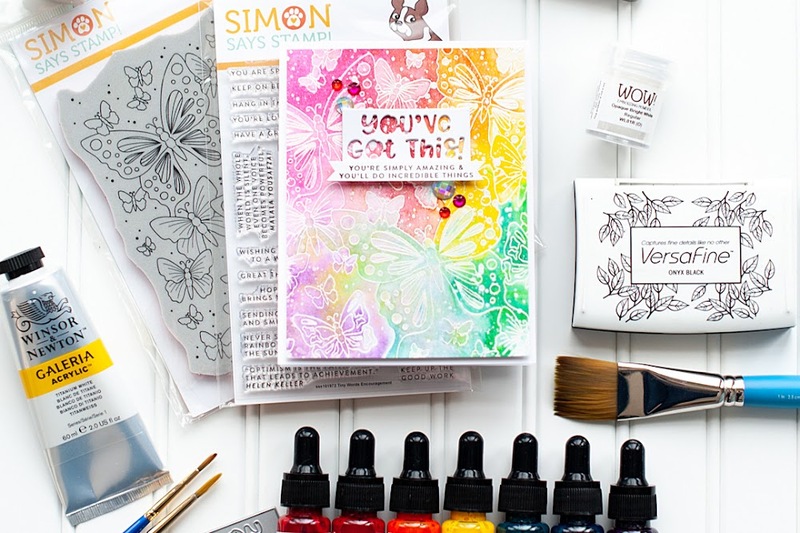 Love the ribbon work, and I love how you always use such interesting layouts! They always inspire me. Gorgeous card! Love the pleated ribbon! What a beautiful combination, Lea! The colors and all of the other goodies. Thanks so much for being an honorary part of our team this week via Wplus9. No worries on the colors...I absolutely love your interpretation of our color story and hope that you will join us again soon! LOVE LOVE LOVE this Lea!!! Well, regardless of the whoops color, I think you've got a gorgeous card here, Lea. It's very inspiring! We Play Date Cafe gals are so glad to play alongside the Wplus9 girls this week...it's been fun! Wow, Lea...this is absolutely beautiful! Your colors are right on and that design is fantastic...but what really caught my eye is that striking navy blue ribbon. Just delightful! So glad to have you and the WPlus9 DT members playing along with us at the Cafe! This is sooooooo beautiful! I love your paper mix and the gorgeous ribbon treatment with the elegant twine ... this is simply perfect! It's great to have you and the WPlus9 DT playing along with us at the Play Date Cafe Lea! I always love what you create! I'm glad I'm not the only one that has whoops moments lol. OHHH! This is super beautiful! I love everythin--the layers, the papers, the stamps...but my fav part is that ribbon treatment! LOOOOOOOOOOVE and LUSH:) Thank you so much for playing along with us over at the PDCC!